My little red rocket (yes, that's what I call my red Hyundai Accent) is ill. I think we fried his insides when we jumped started him with a cruiser. He couldn't take the power of a Crown Vic and short circuited. Which means I have not been able to drive him the last few days, and the boy is at work. It's too far to walk to my gym, and there is no bus route that easily gets me there. 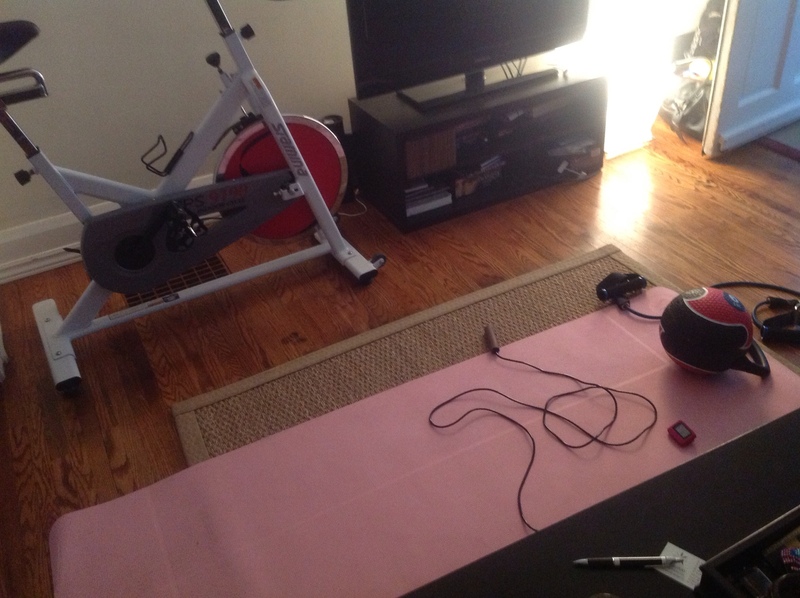 So, I have had to improvise my training and settle for an at-home workout. I love Saturday Team O'Brien leg camps, so that is what I fashioned this circuit after – minus the weight machines and squat racks. I think I did a pretty good job, because I'm still shaky and out of breath! 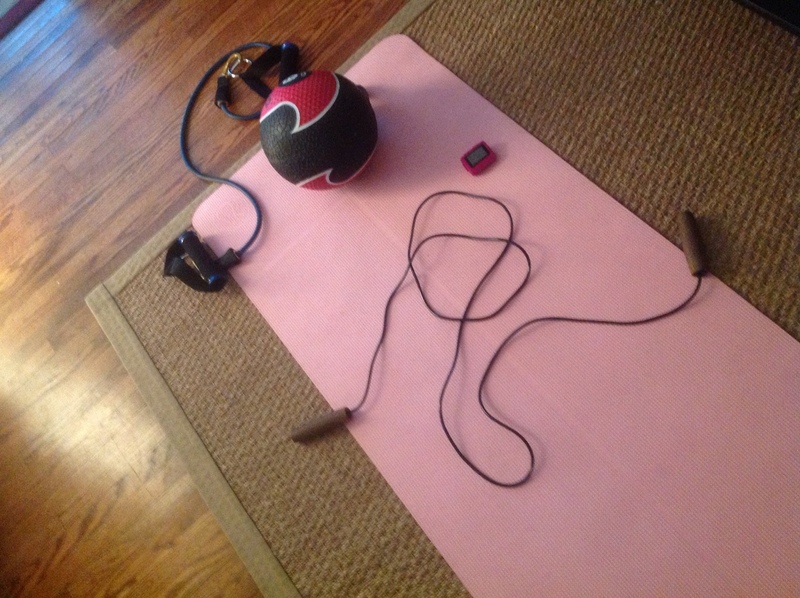 weighted medicine ball – mine is 6lbs and has a handle. You can use anything you have around the house, including cans of tomatoes! Gym Boss interval timer set to 01:30 on, 00:10 sec rest for 16 intervals. You can use a plain old stop watch or any interval timer app that the App Store offers. ABS: Ball push to feet. Lying down on your back, feet up in the air. Hold the ball between both hands and push it towards your feet. It's a small movement, but really works your upper abs. ABS: medicine ball pike. Start in a flat, lying down, position. Raise your arms and feet at the same time, remain slow and controlled. This is a tough movement to master, but works your entire abdominal chain. Exercise band side lat raises – right arm, strong resistance. Pay attention to form. Exercise band side lat raises – left arm, same as above. Medicine ball push ups. Start in a plank position, with one hand up on the ball. Do a push up, then roll the ball to the other hand and do another push up. Continue for the full 01:30. Medicine ball front raise to side, side raise to front – alternating arms. It's a similar movement to a dumbbell up and back. I don't want to hear that you have no room in your house, look at the space I had to work with!! Let me know what you think of the circuit! Awesome effort and advocate of the “no excuses” rule! Can’t wait to hear the update! Thankfully I have a gym as part of my apartment block 🙂 (I also haven’t got a car yet as a new resident of LA!). As you say, it’s a great fully body workout and fantastic fat burner!